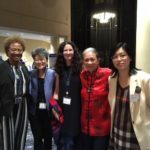 I traveled to Washington, DC to the United Chinese Americans convention to speak on a panel about the civil rights legacy of Asian Americans on September 28, 2018. I had never been to a UCA event before, though I had heard of the fine work by Haipei Shue to support Sherry Chen, Xiaoxing Xi and other law-abiding Chinese Americans against the trumped up arrests and persecution by FBI and feds under the guise of “national security.” I was eager to get to know the UCA, as well as to join the panel with Frank Wu, John Yang and Floyd Mori, all terrific API community advocates. Our plenary session seemed to go well, but when audience questions were invited, a hand shot up: it was my journalist colleague and friend from many moons ago, Paula Madison, the renown NBC anchor, station general manager, author and filmmaker who has been a leading light in the National Association of Black Journalists. 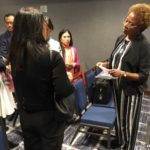 The first time I met Paula was probably at a UNITY-Journalists of Color gathering at least 2 decades ago–and she had shared her Chinese heritage with me then, telling me about her Hakka grandfather and her Jamaican-Chinese mother. Back then, I had already written, in my book Asian American Dreams, about the hundreds of thousands of indentured laborers from China, India and elsewhere who were taken to the Caribbean and Latin America in the 1800s. Those mostly male workers formed family relationships with local black and brown women. In the two decades since I first met Paula, she had been on a quest to trace her family’s roots back to China—and she found the family of her grandfather, Samuel Lowe, aka Lo or Luo, all the way to her ancestral village in Guangdong province, near Shenzhen, more than 150 generations back! I recognized Paula as she stood up and stated in no uncertain terms that she was deeply disappointed in our panel because we spoke almost entirely about *East* Asians, and Han Chinese, and had excluded others of the infinite variety and broad diversity of Asianness. Most particularly, in our conversation about civil rights and building bridges, we had neglected to acknowledge the existence of Afro-Chinese and other multiracial Asians. As Paula spoke, I knew that she was absolutely right on! Though the moderator apologized and took full responsibility for the oversight, I also felt embarrassed and ashamed that I too had neglected to make clear that there is great diversity within the Asian American community. With the privilege that comes with being accepted as Chinese with my Han and “typical” East Asian features, it had not occurred to me to mention our racial/ethnic diversity even though Paula and other multiracial Asians/Chinese were in the audience. Another example of how privilege can make you blind to others who lack that privilege. Another reminder to recognize and own our privilege! If we are to imagine empowering the multiracial society that the US is rapidly becoming, we must recognize all in our APA communities, as well as other marginalized communities. Right? Indeed, if we are to overcome the white/male/supremacists/nativists who are wreaking havoc in the US and the globe, it is essential that we come together as women, people of color and people of conscience – for if we can imagine a united future and make it happen, we will be a force that cannot be defeated! Please be sure to read Paula Madison’s Finding Samuel Lowe: From Harlem to China, her family’s incredible journey to connect with their Chinese roots and family in China–accomplishing far more family history than most others in the Chinese diaspora! And watch the documentary of their quest in the DVD. Her Afro-Jamaican-Chinese family is a vision to behold, a beacon to the future–and the future is now!